FontFamily: Gets or sets the font family of the control. FontWeight: – Gets or sets the weight or thickness of the specified font. FontSize: – Gets or sets the default font size. Foreground: - Gets or sets a brush that describes the foreground color. LabelTemplate: – Gets or sets a DataTemplate that is applied to the labels. It is important to keep in mind that the default LabelTemplate is set in such a way that the performance of the control is the greatest possible.We use Image objects in order to bring better performance when the heatmap control is resized. Row: А string property which gets or sets the row name of the corresponding cell. Column: А string property which gets or sets the column name of the corresponding cell. Value: Аn integer property which gets or sets the value of the corresponding cell. To fill the RadHeatMap with sample data we can create a list of PlotInfo objects and set it as DataContext of the control. 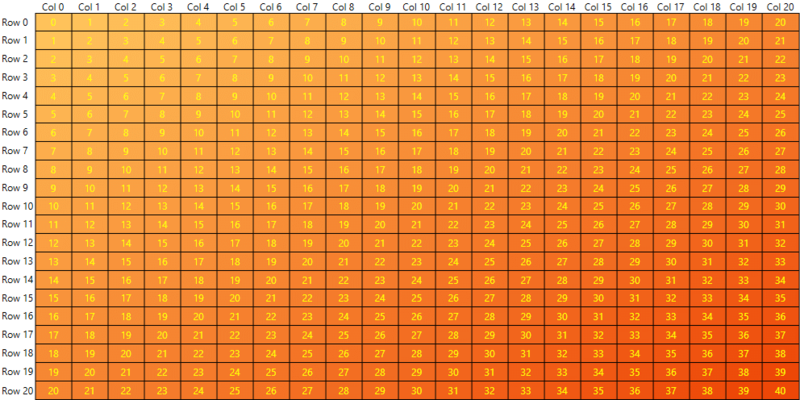 After having the sample data ready we can go in the XAML code and define the RadHeatMap and the CellLabelSettings.